These push-for-service systems are ideal for simple paging requirements such as service buttons or for calling for help to come to work stations, exam rooms or locked doors. The transmitters send programmable text messages such as location names, which is important when you have buttons in multiple locations. 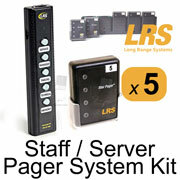 These pager sets include a ... more. This system is ideal for simple paging requirements such as push-for-service service counter buttons or calling managers to the front of the house when things get busy. 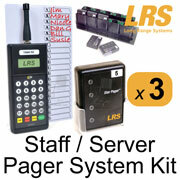 The set includes an LRS Butler II five-button push-for-service transmitter and options for two, three or five alphanumeric text display pagers and a program kit. Works wi... more. 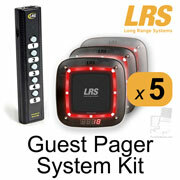 This is a small and inexpensive restaurant guest pager system that's perfect for when your paging needs are occasional, simple or minimal. Though the five pagers in this set are too few for many restaurants, restaurant guest pager systems are also great all-purpose local area pagers. These pagers are also commonly used to call patients ... more. 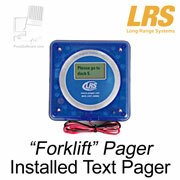 These Forklift Pagers with Text Messaging are individual pagers that can be added to many LRS Pager systems to increase the total number of pagers to any quantity desired. Forklift Pagers are part of a simple messaging system which quickly delivers hard-to-ignore messages to forklift drivers or operators of any similar equipment where ... more. 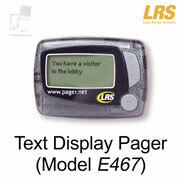 These are individual text (also called alphanumeric, manager or E467) pagers that can be added to LRS pager systems to add text-messaging features to the system. 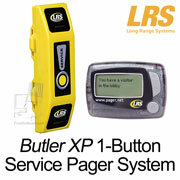 Text pagers show full alphanumeric messages on four-line displays of up to 200 characters in total. Typical uses include urgent and specific ... more. This system is ideal for simple paging requirements such as push-for-service service counter buttons or calling managers to the front of the house when things get busy. 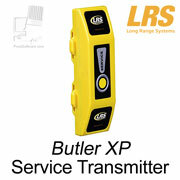 The set includes an LRS Butler II five-button push-for-service transmitter and one alphanumeric text display pagers and a program kit. Works with optional door sensors an... more.